Olaf (Homepage) wrote: The Crookedest Street in the Nature, like the Lombard Street in SF. Stunning image! Andrés (Homepage) wrote: Strange image. I like the texture and tones very much. 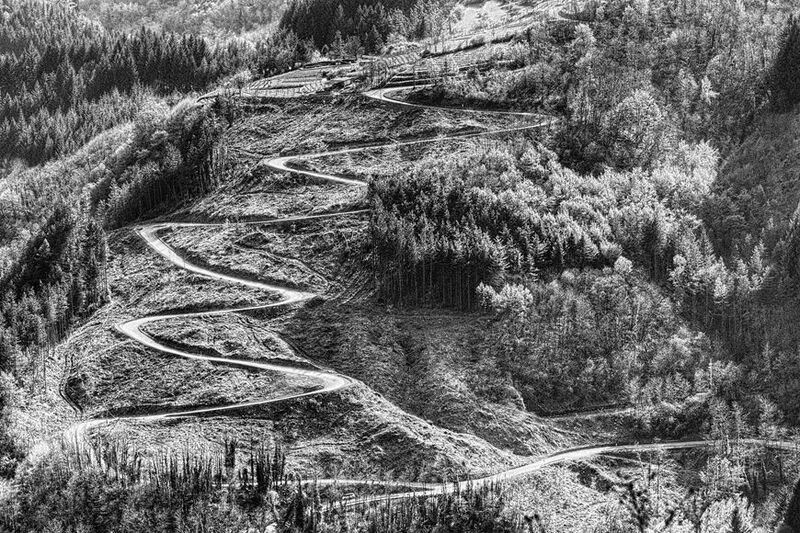 Claus Petersen (Homepage) wrote: Cool how the road just slithers up the hill like a snake here. Frida (Homepage) wrote: Riding a bike down this road would make my head spin ;-) Well seen and captured. Arjan - PlasticDaisy (Homepage) wrote: Another wonderful find! And processing it like this, with some noise making it a little gritty, works really well. crash (Homepage) wrote: don't these people believe in straight lines up the hill !?!??! Kala (Homepage) wrote: Fantastic wide angle perspective from above. Rob (Homepage) wrote: Stunning image! oldshutterhand (Homepage) wrote: Fantastic details of a great landscape. Arnd (Homepage) wrote: Impressive example for the detrimental human intervention in nature. Love your b&w conversion. Abhijit Dharmadhikari (Homepage) wrote: Excellent b&w image. Perfect Zone system! Marcie (Homepage) wrote: What an incredible point of view. Love the winding road. Like a snake!! !